Gerdau, the leading producer of long steel in the Americas and one of the largest suppliers of special steel in the world, have adopted five villages under the smart village ward initiative by the government of Andhra Pradesh. The villages adopted under this noble cause are Jambulapadu, Hussainapuram, Veerapuram, Bodaipalli and Challavaripalli. 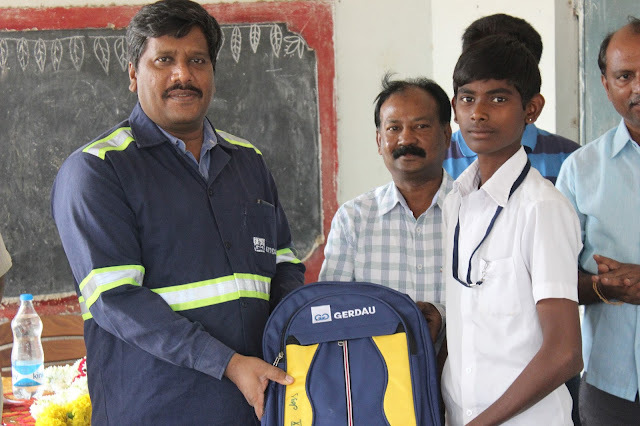 In their continual quest at improving the standard of life for the villagers Gerdau recently distributed school kits to 500 children which are worth 3.00 Lakhs approximately and donated 2 computers to the ZP High School, Bodaipalli and inaugurated a boundary wall for the school costing Rs. 10.00 lakh approximately. The company in line with government initiatives to improve the standard of living of the villagers has taken this step to help school children by providing a complete school kit which contains notebooks, school bags, pencils and other required stationary. “To fulfil our continual commitment towards the community we ensure that we undertake various programmes in different parts of the Mandal regularly. This initiative was organised at the villages we adopted in order to provide better living conditions. In addition to this, Gerdau has also undertaken several community development initiatives which enable them to achieve sustainable development. They include initiatives such as providing sanitation facilities, organising medical camps, distributing LED lights, etc said Mr. Sridhar Krishnamoorthy, Managing Director, Gerdau Steel India. Gerdau is the leading producer of long steel in the Americas and one of the largest suppliers of special long steel in the world. It has more than 45,000 employees and industrial operations in 14 countries with operations in the Americas, Europe and Asia, which together represent an installed capacity of more than 25 million metric tons of steel per year. Gerdau is the largest recycler in Latin America and around the world and transforms millions of metric tons of scrap into steel every year. Gerdau is listed on the stock exchanges of São Paulo, New York and Madrid, and has approximately 140,000 shareholders.